Our objective is to design and deliver the best in class high tech splinting products as they pertain to the support and comfort of the human body extremities. We are dedicated to serve our customer base irrespective of their location or environmental restrictions and provide them with break through information or resources as it arrives in our industry. We know and understand our business and many times anticipate our customer requirements. We have been delivering value, great products and service for over 20 years and we continue to do so. Our passion is delivering simple yet effective, usable, successful EMS splint related products to the market to save limbs and lives. 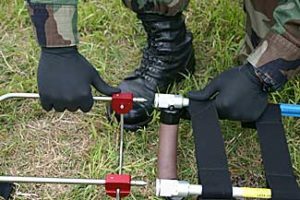 For over 20 years Reel Research and Development Corporation has provided long lasting, high tech EMT splinting products that primarily support our U. S. Military operations throughout the world. Our products literally saves the lives and limbs of military and civilians and is the only product that many EMT professionals highly recommend with compassion and testimonials. Our industry experience and knowledge is simply unsurpassed. We are the primary consultants with many EMT and Ambulatory organizations throughout the North American Continent however, our clients and distributors exist around the globe. We invite you to peruse our site and review our technical resources, products, distributor locations, photos and more! We look forward to hearing from you!